Abstract: This article showcases both the conventional and disruptive features of web annotation as media practice. To do so, we orchestrated a series of thematic exchanges about media practice, specifically those associated with openness and politics. We then publicly invited responses to our initial manuscript via the online web annotation platform Hypothes.is. The two thematic conversations inspired an ensemble of public contributors to join us in ongoing discussion for over a month, layering atop our source text over 100 original web annotations, creating a laminated and multi-authored document. Following this shared activity, we reflected upon our experience and the generated content, and authored a complementary synthesis that explores the tenor and tensions of web annotation as a disruptive media practice, as well as web annotation as performative publishing. Alongside public contributors, we worked a cyclical dialectic of process and product, discussing web annotation as disruptive media practice by publicly practicing web annotation as an act of co-created disruption. It is our hope that this experiment-turned-article, part collaboratively authored dialogue and part post-hoc synthesis, models and begins to theorize new and disruptive media practices for research design, peer review, and scholarly communication. We advanced our contribution to this “disrupted” issue of the Journal of Media Practice based upon two tacit presumptions. First, we believe that the features of web annotation – whether social, technical, or political – are amplifications of traditional media practices. It is possible to connect web annotation to both historic precedent and contemporary influence; from Bush’s (1945) predictions of “a new profession of trail blazers, those who find delight in the task of establishing useful trails through the enormous mass of the common record” (sec. 8, par. 2), to recent commentary about the role of new technologies in amplifying dynamic qualities of written text, for “texts have always been liquid and living… changing technology just brings to our attention things we should have been thinking about” (McDougall 2015, 5). Web annotation complements everyday activities associated with mediated information literacy, such as how people access media, curate resources, converse, and critique ideas and power. We also contend that web annotation has the potential to alter conventional author-reader interactions with information and media. Though it may seem paradoxical, web annotation is both closely associated with everyday media practices and also necessarily disruptive of those very practices. Such disruption meaningfully emerges given certain conditions. For example, while an individual can publicly or privately annotate online texts using a variety of free web-based platforms, the disruptive possibilities associated with social and collaborative annotation become readily apparent when these practices occur with greater speed and at broader scales (Schacht 2015). Web annotation may also be disruptive of formal education and enabling of student-centered and interest-driven learning when embraced as hybrid learning opportunities that thrive alongside “the digital margins of our daily lives” (Dean and Schulten 2015, par. 7; see also Collier  and Hollett and Kalir ). Our exchange was also inspired, in part, by recent conversation-as-scholarship that has explored relationships among media practices and participatory cultures (Jenkins, Ito, and boyd 2015). Additionally, we echoed this journal’s previous openness towards disruption through multivocal discourse that brings “different perspectives to the conversation, transparently” (McDougall 2015, 1). Furthermore, the layering of public annotation as commentary and ongoing conversation atop an initial exchange recalls Goffman’s (1981) attention to social interaction as “laminated,” or the ways in which everyday communication is composed of multiple and overlapping layers of referents, meanings, and negotiations. Finally, we found that Prior’s (2001) emphasis on “reenvoicing” resonated strongly with our effort, as “written texts may be quite literally multi-voiced, the product of heterogeneous processes in which multiple texts and authors come to intermingle in a single text” (68). How, specifically, did multiple texts and authors intermingle in our collaborative exchange? To showcase both the everyday, or more conventional, as well as disruptive features of – and possibilities for – web annotation, we (Kalir and Dean) orchestrated a series of thematic exchanges about media practices, and then invited responses to our initial manuscript via the online annotation platform Hypothes.is (see Perkel  for a description of how the Hypothes.is platform affords annotation of the scholarly web). In December of 2016, we published online a back-and-forth dialogue structured by two keywords – openness and politics (included below). These two thematic conversations inspired an ensemble of public contributors to join us in ongoing discussion for a few months, through February of 2017. The contributors were a smattering of educators writ large, including K-12 classroom teachers and administrators, an education consultant, a graduate student, and a few professors from related disciplines; some in this emergent collective were close colleagues, whereas others joined via “weak ties” (Granovetter 1973) established from online social networks like Twitter. In concert with this group, we worked a cyclical dialectic of process and product, discussing web annotation as disruptive media practice by publicly practicing web annotation as an act of co-created disruption. Together, all annotators layered atop the original 5,320 words more than 100 Hypothes.is web annotations; among the many original annotations and threaded replies, we (Kalir and Dean) authored 2 original annotations and 34 replies. This layer of web annotation, as a whole, added more than 6,000 words, creating a laminated and multi-vocal text that was both substantive and experimental, playful and provocative. Yet by creating the conditions for – and in helping to author – this conversation, it is necessary to also recognize how aspects of power were inherent to both the content and process of our effort. We selected the two keywords that guided our initial exchange and the subsequent responses from contributors. The themes of openness and politics reflected our biases toward content that we deemed timely, of consequence, and inviting of public discourse. We then directed interaction via Hypothes.is, a decision that amplified our proof of concept yet may have inadvertently constrained participation (i.e. requiring internet access and an account with a specific annotation client). Like any cultural technology, the Hypothes.is web annotation platform affords particular behaviors; in the context of our conversation, this tool helped establish ground rules for what counted as mediated dialogue. Such an activity structure instantiated its own mesh of political and power relations that contingently reflected multiple factors, including contributors’ interest in and access to our exchange, perceived risks associated with public participation, and our actions. Many contributions by annotators expressed curiosity, as with actualham’s question, “What exactly makes the sociality or structure of a space ‘open’?”. Some annotations incorporated the conventions of social media upvoting, like BMBOD’s standalone “+1.” One annotation included a screenshot of text as a picture embedded in the annotation – onewheeljoe’s reference to Rheingold’s (2012) Net Smart when remarking upon social norms in online interaction. And ndsteinmetz addressed the tangled relations among power, voice, and authority directly when noting: “How often we presume the author to be the authority. It’s important to be open and willing to listen to the ideas of others if we are really seeking expertise.” We encourage readers to access and then continue interpreting and further disrupting these conversations in situ via http://bit.ly/JMPannotation. We hope that the synthesis provided here, as another discursive layer, facilitates continued conversation beyond what may be perceived as a static end-point via publication as a more conventional journal article. We present a series of insights gleaned from this experience about web annotation as an everyday and disruptive media practice. Specifically, we discuss the tenor and tensions of web annotation as disruptive media, as well as qualities of web annotation as performative publishing. Our dialogue suggests that while web annotation is both a traditional and disruptive media practice, there is no consensus about the full meaning and import of such disruption for everyday activities like (online) reading, writing, and learning (see related discussions by Glover, Xu, and Hardaker , Jones , and Schneider, Groza, and Passant ). What, precisely, is being disrupted by web annotation – a text, a point of view, or the conventions of written and scholarly discourse? Regarding power architected by annotation technologies, who benefits, and who may be harmed (e.g. Perton 2016), by such disruption? And under what conditions is this disruptive practice useful, merely superfluous noise, or a harbinger of changes to processes like academic peer review and regular author-reader interaction? The tenor of web annotation as disruptive media is defined in no small measure by attendant tensions about the locus, meaning, and impact of such disruption. There is, truly, so much potential in these tools and approaches toward asynchronous, distributed reading and writing. One question I have, already, is how such distributed forms of production-consumption further dissolve notions of textuality and authorship so entrenched within traditional notions and practices of scholarship and empirical research. A dissipation of “traditional notions and practices” associated with inquiry and peer review is evident, in and of itself, by the fact that we convened an interdisciplinary conversation among higher education professors, K-12 teachers, and education technologists as one attempt at “evolution” in scholarly production (Walker 2016) . We contend this is a notable accomplishment given momentum toward specialization and siloed expertise within the academy (e.g. Jacobs, 2013), as well as longterm and well-worn disconnects between the concerns of K-12 and higher education stakeholders. Moreover, our annotated conversation disrupts the largely transactional – rather than discursive and more equitable – relationship between those who develop tools and media (i.e. technologists) and those who adopt and use technologies, like educators (there are, of course, notable exceptions, from Papert  to Williams-Pierce ). While imbued with tensions between power and voice, our resultant dialogue troubles assumptions of expertise, discipline, and context associated not only with focal subjects (i.e. openness, politics, media), but also with the formal steps of collective inquiry, collaborative writing, and peer review. In this respect, we join Fitzpatrick (2011) in exploring “the extent to which the means of media production and distribution are undergoing a process of radical democratization in the Web 2.0 era, and a desire to test the limits of that democratization” (16). Our experiment pushed against a boundary of participatory scholarship, whereby a diverse collective of reader-annotators challenged presumptions of authorial expertise, and also collapsed the distance and distinction between producer and consumer. While inspired by the content and process of our multi-authored dialogue, we also believe more robust possibilities for web annotation as disruptive media have yet to be fully realized among and across various academic disciplines, scholarly activities, and everyday media practices. Web annotation is also a promising means for enacting and exploring new registers among the performative aspects of publication. Many intellectual and scholarly activities are performative; whether in practice or metaphor, the performativity of publication appears throughout private and anonymous processes like peer review, as well as the public dissemination and debate of scholarship. In this discussion, we suggest web annotation is distinctly performative, expanding possibilities for how publications may be produced, engaged, and transformed, particularly in the realm of open scholarship. Like improvisation among a group of musicians, our ensemble created and subsequently curated moments of both harmony and dissonance (e.g. Lewis 2000), as a heteroglossic crescendo – authored during our initial dialogue and amplified via annotation and reply – surfaced various forms of text, agency, and materiality (see also Holden, Poggione, and Kupperman , Liu , and Long ). Glimpses of such intricate arrangement appear throughout our dialogue, from SenorG’s comment that began with the caveat “Allow me to push back a bit here,” and which inspired four replies from three other annotators, to actualham’s observation “I love that H [Hypothes.is] lets us focus on critique without a requirement that we devalue the work – in fact, quite the opposite (we critique what has value and potential and impact and utility).” As this special issue about disruptive media explores the range and resonance of performative publishing, we suggest web annotation both accentuates and helps record a number of distinctive and salient qualities about performance in scholarly production and interaction. From Gutenberg’s printing press to experiments in open peer review (e.g. Fitzpatrick 2011), there is little doubt that processes of publication have been, and will continue to be, influenced by contexts of social and technical interaction. Platforms like Hypothes.is, which afford social and collaborative web annotation, demonstrate the ease with which authors and their audience can create a sociotechnical milieu to share thinking in progress, voice wonder, and rehearse informal dispositions in service of publication. 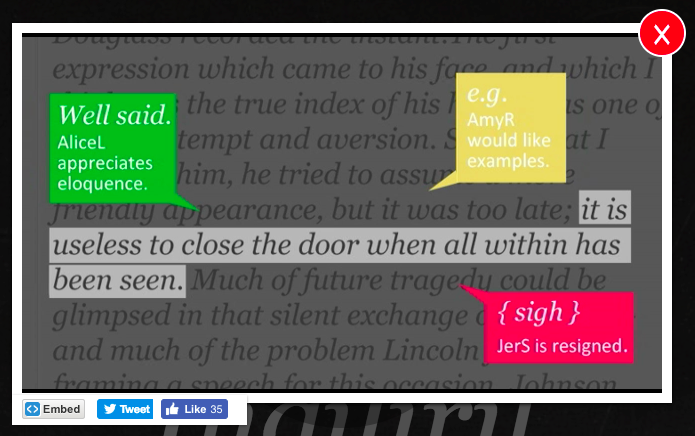 In this respect, web annotation is an unscripted performance, with expressions of agreement, criticism, and curiosity improvised toward unknown outcomes and meanings. After we posted our initial exchange, and posited our formative thoughts about openness and politics, we could not have anticipated – much less controlled – who would join as reader or conversant, what they would contribute as an annotator, and how we would subsequently react. Such participatory contingency reiterates how the social context instantiated by web annotation is not free of conflict, with inevitable tension generative of hybrid discourses that are cyclically produced, interpreted, and interrupted. While any published text is the result of a temporally-bound process, the iterative affordances of web annotation alter the temporal fluidity of textual production, revision, and publication. Ensemble interaction sustained by web annotation remains temporally fluid for greater periods of time; the shifting cadences of fluctuating text are less stable yet more visible, and the tensions and tradeoffs of revision easily discerned. Similar to the acts of a play and the movements of an orchestral score, an annotated text unfurls given activity stretched over time (e.g. Hollett and Kalir 2016), defined by bursts of activity, welcome intermission, and renewed engagement. Furthermore, web annotation also affords curation, creating a static but unstable record of this emergent and dynamic performance, accenting via hypertext particular ideas and moments from a malleable document. As one means of conclusion (for we genuinely hope that conversation continues, and that this article does not represent completion), we offer a critical reflection about our initial exchange and subsequent annotation conversation. We anticipated, given the sociotechnical affordances of the Hypothes.is platform and our prior experiences designing learning opportunities via collaborative web annotation, that discourse about provocative content (such as openness and politics) would elicit substantive response from readers-as-annotators. Yet as a manufactured effort for this special issue, it is feasible – and fair – to suggest that this dialogue was a contrived experiment. While this exercise had an unknown outcome, it also favored predictable participation. At the same time, even given such expectations, the radical openness of the project nonetheless made the authors productively uncomfortable at times. Such a deliberatively performative stance toward disruption highlights a tension between artifice and authenticity. There are, for example, established academic communities of practice that regularly use open web annotation to accomplish their goals (e.g. Revkin 2016; Udell 2017). As a point of contrast to our dialogue, we suggest scholarship also examine how the conventional and disruptive media practices afforded by web annotation have already been adopted and adapted by established academic and interest-driven groups. In the introduction to our original dialogue we remarked, “One challenge is whether – or how – this conversation becomes generative of traditional scholarship, such as a more linear, peer-reviewed article.” Atop this wondering, contributor amidont layered an annotation which stated in part: “Flattened hierarchies, especially, threaten the institutionalized power structures which have tightly controlled the design, review, and dissemination of scholarship and research.” It is our hope that this experiment-turned-article, part collaboratively authored dialogue and part post-hoc synthesis, models and begins to theorize new and disruptive media practices for research design, peer review, and scholarly communication. Our initial series of thematic exchanges – below – was authored, published here, and annotated in early December, 2016. This is a series of thematic conversations on the politics and practices of web annotation between Remi Kalir, Assistant Professor of Information and Learning Technologies at the University of Colorado Denver, and Jeremy Dean, Director of Education for Hypothes.is. We have each chosen specific keywords and offered the other an initial provocation. A dialogue ensued. Once published online, this dialogue will be interrupted through the practice of web annotation itself as we invite colleagues to join our conversation and further open the growing discourse to the public. We have performed a scholarly dialogue and invited interpretation of that conversation through the modern social media practice of web annotation. One challenge is whether – or how – this conversation becomes generative of traditional scholarship, such as a more linear, peer-reviewed article. We recognize that this distributed conversation may in the end be too ethereal or too noisy, testing our ability to subsequently and usefully capture and represent a layered, versioned textual experience as more conventional academic prose. We embrace the emergent and unpredictable quality of web annotation as an opportunity to remark upon and disrupt scholarly communication and knowledge production. Jeremy’s provocation: Remi, you and I have been talking about open web annotation for a while now and one tension I recall in these conversations is our seemingly different definitions of what “open” means in that phrase. This is not a unique problem; I’m at OpenEd16 right now and there are a number of different, sometimes conflicting definitions circulating in presentations and hallways. In terms of defining the “open” in open web annotation, I tend to take a standards approach: the Hypothes.is tool is built upon, and our organization advocates for, open standards in web annotation. These are standards developed collaboratively by w3c members with the intent that if annotation is to become part of the basic infrastructure of the web, that such functionality needs to be open like the web itself. People should be allowed to access annotations using whatever client they choose just as they can use their browser of choice to access the web. When you talk about open, I feel like what you mean is “public” or even “collaborative.” I’ve called you out on this a few times, trying to note the difference, perhaps with an agenda regarding standards. But in reflecting on the term for this conversation, I’m not sure they are different, or at least I think we might think of them as more connected than I at least have suggested. Shared standards for example enable collaboration. But I don’t want to put words in your mouth, so let’s hear your response. RK: You’ve captured a keen observation associated with my initial use of “open” web annotation, an observation that reflects my broader trajectory as a learner and an educator who has only recently stumbled into the social practices of web annotation. I’ll begin with a caveat because I study how people learn with digital media – let’s set aside (at least momentarily) the substantial, at times ambiguous, and also contested variations of “open” associated with aspects of formal education (very likely what you heard about at OpenEd16), such as open educational resources (or OERs), open pedagogy and educational practices (or OEPs), and open data. Why? Because this is a conversation, not a literature review. Because “open” may face a similar fate as befell “design” and “innovation,” terms that are alternatively inspiring and incomprehensible, both motivation and muddled jargon. And because open sounds good; whatever is “open” promises increased access, maybe transparency or cost-savings, perhaps brand recognition and impact. To label something as “open” establishes what the linguist George Lakoff calls a frame, with the antithesis to be avoided or judged as possibly inferior. Afterall, how forcefully might a professor (much less a vendor!) advocate for closed educational resources, or unavailable pedagogy, or biased data? While web annotation does have strong affinity with framings of open in formal education contexts, I suggest we table that analysis for the moment. So yes, my initial perception of web annotation did associate open with public. It also emphasized “open-ended,” a nod to the emergent and unanticipated activities associated with more playful learning. And I also perceived web annotation as a means of checking my tacit authority, as distributing the source and concern of conversation amongst learners and away from my agenda. Noting this idealized conception, it’s useful to contrast my nascent thinking with reflections on my experience with open web annotation at the conclusion of this course. How did my experience, alongside a cohort of graduate learners, alter my definition of open? Briefly, I came to understand open as an invitation for reciprocal networking, the ongoing negotiation of power, and as ambiguity. 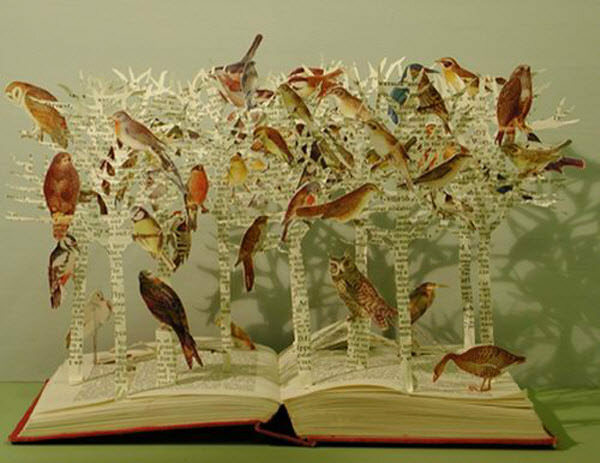 Open web annotation invited people to connect and work through meaning-making processes (to literally net-work), to amplify and honor divergent voices and viewpoints, and to orchestrate shared authorship. Perhaps these were some of the local “standards” that my graduate learners and I collaboratively established through our use of open web annotation. JD: I love that you brought in “open-endedness” and ambiguity here. Web annotation clearly decenters authority or expertise in several ways. It enables everyday internet citizens to speak back to the authority of the web and offer their own expertise. And it enables students to speak back to texts, authors, and teachers, showcasing their own expertise. From a lit crit perspective – my own background – web annotation truly enacts the idea of a text as an unfinished thing from authorship through various contexts of readership. From the vantage of the educational technology industry, this open-endedness is something of a problem for Hypothes.is in terms of marketability. Our flexibility goes against the templated idea of educational technology tools that dominate the scene. It’s very hard to quantify that datum generated from such a tool and thus very hard to sell it. Let me give a specific example: There’s another annotation tool called Ponder that – at least last I checked – allowed students to attach a preset (though variable) set of terms to specific selections of text. It touts itself as a critical reading tool but in fact delimits the variability of a reader’s response to a text, not to mention a teacher’s approach to textual analysis. But it can generate some beautiful data! A teacher can get a report of how students responded to a short story under study, how many students were “inspired” by a certain passage, how many were “confused” by another. This is neat, though I personally don’t think it pushes students as critical readers as far as other uses of social annotation. But it’s likely far more scallable and marketable then what Hypothes.is currently offers, for better or worse. This open-endedness of web annotation might become problematic at scale on the open web as well. After an annotatathon on his book Ethical Programs, my friend Jim Brown was excited about what he saw but raised an important question: What is annotation as a genre? I think what he observed in the annotations was a wide range of reader responses, some highly engaging, others less clearly so. Think about this, Remi: We’ve had some great collaborative annotation experiences – you and I with our web colleagues. But what will those conversations look like to random people stumbling upon them? Will they make sense out of the context of that community? Are those conversations really all that hospitable? Or are they almost too open? Perhaps we should include some links here to get feedback from others! RK: I’ll circle back in short order to your questions about so-called “outsiders” stumbling upon a public annotation conversation, the meaning-making that may (or may not) occur in such circumstances, and whether – or how – those discussions are open (that is, inviting) to others. First, I’d like to address the example of Ponder and what I perceive to be a related example – a research project, recently launched between computer scientists at the University of Colorado Boulder and the publisher OpenStax, to develop a “smart” open textbook by studying undergraduate students’ highlighting practices. Why mention this research project alongside your Ponder example? Because irrespective of their differences, both efforts constrain notions of open by positioning annotation as an individual task. Annotation is something a sole reader might do when reacting to a given text and in the service of a broader (and presumably more important) objective. Whether with the middle school student who provides a filtered response or the undergraduate student who can only highlight a particular passage for the purposes of test preparation, the activity of annotation is neither social nor designed as a collaborative enterprise. In short, the activity of annotation is enacted to support an individual accomplishment – reading comprehension. The technical affordances of these annotation efforts delimit opportunity for social imagination in favor of controlled and more rote expression. However we may define open in the context of web annotation, I strongly believe there is a social aspect to reading and writing the web. This will likely come across as a bit pollyannaish, but I believe that a reader’s decision to participate in public web annotation carries an implicit social contract; that my contributions are open to your response, that my ideas are open your dissent, and that my assertions are open to your rebuttal. Of course there are digital annotation opportunities available for readers and learners that may occur on so-called open textbooks or public web pages, and that are not concerned with a social realm or impact. However, I hope that open web annotation carries a more intentional social commitment that may work toward both specific outcomes (such as an educational goal, like reading comprehension) while also valuing the collaborative processes of shared and public meaning-making in and of itself. Which brings me back to your questions about public web annotation adventures (for lack of a better phrase). We’ve begun to regularly organize various social opportunities for collective – and collaborative – web annotation. Recently, we’ve decided to call these annotation “flash mobs” (I also really like the term “annotatathon,” and here’s another example from our friend and colleague Maha Bali). In our flash mobs, we work with colleagues to select a focal text, we determine when it’s convenient to gather at and atop the text, and then we begin reading and writing together with various conversations spiraling about based upon the group, shared interest, and curiosities and affinities that arise through the back-and-forth of discourse. An example of this is our Marginal Syllabus project, an effort to bring educators together and discuss educational equity through web annotation. And what might happen when someone who has not participated in this emergent affinity space stumbles upon these curated conversations? My hope is that the transparency of content is secondary to the transparency of process. It is entirely conceivable that a mathematics educator reads annotations produced during a flash mob and perceives little relevance to professional practice (I began my career as a middle school mathematics teacher, and I can easily imagine my former self in such a circumstance). Or consider an educator might deeply appreciate the spirit of such a conversation, yet remain confused or curious about the nuance of a given exchange because they did not participate in-the-moment. And that can be OK if entry points to the process of meaning-making are discernible, and if supports are in place for others to have similar conversations themselves. The practices of open web annotation should be a participatory process in and of themselves, with tools like Hypothes.is creating the technical and social conditions for communities to curate conversations with texts and about topics that matter to them and that meet their needs (a great example of this is Climate Feedback). We can and we should strive to enact public conversations online that are inviting and inclusive. At the same time, I hope we can promote a socio-technical architecture, buttressed by the tools and practices of open web annotation, that enables more diverse and divergent conversation. JD: Thanks for bringing up the Climate Feedback project. It’s a model for how I hope web annotation gets used more in the future–more academics deploying annotation for public scholarship, more groups of students doing this work as well, learning to be critical readers of media and producers of knowledge themselves. For those that don’t know, Climate Feedback is a collective of climate scientists using Hypothes.is to call out mainstream media coverage of climate change. It’s a great example of web annotation as disruptive media practice. And its disruption is predicated on several levels of openness. First, the openness of the web itself, based on the HTML standard–the syntax of most text on the internet. Second, the browser, which is the standards-based environment that our software runs in. 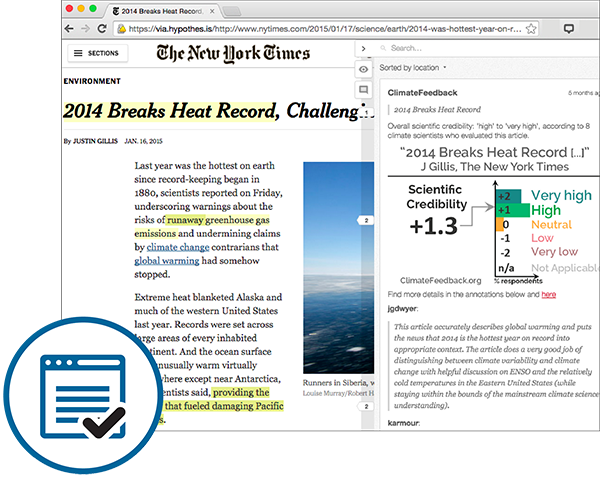 And ultimately the standards for web annotation itself, which are necessary for Climate Feedback to have the biggest impact because it will make their work more accessible to more people. 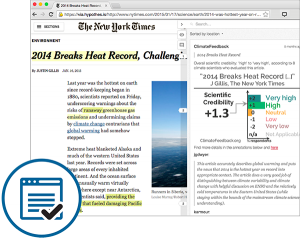 However, while we don’t currently have the feature, the Climate Feedback project would like to function as a public, read-only group of annotators. That is, everyone will be able to see their annotations, but only those invited to the group will be able to write and respond to annotations. This is fine in terms of the Climate Feedback goal of leveraging web annotation and their own expertise to correct ideas about global warming. But it’s closed, right? I suppose what’s important is that while that particular layer may be closed, and there will always be these closed conversations, what’s most important is that with open web annotation, anyone can start a new conversation and invite others to join in. The declaration of open web annotation as a kind of internet right is a basic principle for us at Hypothes.is. Annotation isn’t really all that radical a thing in and of itself. We see it in lots of places and there’s a clear demand for it even in mainstream online journalism. But not necessarily for the open version of it. That is, lots of internet publishers might be interested in an annotation system to replace page-bottom comments, but they want control of that system. For one, they want to be able to moderate the contents. But they also want to be able to claim it as a distinguishing and proprietary feature. Having multiple, closed systems of web annotation doesn’t as radically change our ability to hold quality conversation online. Even if there are private, moderated channels in certain places, there always needs to be an open layer of commentary across all content. Journals we’re working with (or have talked about working with) have asked to remove the public channel in our integration. We’ve always refused to do so. But just imagine the chaos that will ensue when this goes online with Hypothes.is natively embedded! RK: I didn’t know that Hypothes.is has refused requests from journal publishers to limit public annotation, thanks for mentioning that organizational “standard” guiding the organization’s social collaboration. And I hope some of the scholars who participate in Climate Feedback join our exchange, too! Unlike proprietary interests (like Ponder) or prescriptive activity (annotation delimited to highlighting), Climate Feedback illustrates that while it is important to examine the porosity of a given community’s technical, social, and conceptual boundaries, it is just as important to demonstrate how the mode of producing more complex conversation online (to draw ever-so-lightly upon Marx) is accessible to many via distribution among various publics. So perhaps we’ve come full circle to your initial prompt, highlighting tensions endemic to interpretations of open – as simultaneously an emergent set of standards for an “interoperable, sharable, distributed Web annotation architecture” (according to the W3C) that also invites opportunity for more accessible conversation and collaboration. And with that, perhaps we should open this dialogue up for other people to join us. Remi’s provocation: Jeremy – We begin this exchange as the 2016 American presidential election comes to a close. Much of the vitriolic contest has been shaped by conversation about conversation. Both professional media organizations (the so-called Fourth Estate) and personal social media practices have become entangled in meta-commentary about the production, protection, and dissemination of written text, from Hillary Clinton’s use of a private email server, to Wikileaks’ publication of hacked emails, to Donald Trump’s anything-goes, insult-laden tantrums via Twitter. Of course, the use – as well as reuse, and abuse – of online platforms to mediate civic discourse is not an American (or Western) phenomena; one need only to recall the 2009 Green Movement in Iran or, more recently, the Fishball Revolution in Hong Kong. Without ignoring the more macro realms of formal politicking and mass civil disobedience, I’d like to know more about how you understand the localized (dare I say personalized) relations among politics, discourse, and media. More specifically, I’m curious if web annotation is more than a proxy for online commentary about political content. Rather, I wonder if – under certain circumstances – the social and technical affordances of web annotation become a context for, or even a form of, political expression. In this respect, I hope we might consider the following: What is the potential for web annotation to engender a more expansive and participatory politics? JD: The Hypothes.is project very much originated out of the idea of speaking truth to power. If you look back at the original Kickstarter campaign and how our founder Dan Whaley was talking about the project then you can hear this. The idea is there are all these official voices on the web and everyday people need a way to join that conversation. Now this isn’t a new idea. It’s kind of the originating idea of the web itself, and certainly the idea of the Web 2.0 movement – that we’re not just accessing knowledge on the internet, but creating it ourselves. But it’s not at all the way the web has evolved in terms of the everyday ability to effectively question authority, both technically and politically. If anything we may have been duped into thinking everything is more transparent than it is. Siva Vaidyanathan’s The Googlization of Everything was eye-opening for me when it came out in terms of thinking through the tension between the internet as the democratization of information and the internet as yet another, perhaps even more insidious, manifestation of the inextricable relationship between knowledge and power. And it only has gotten worse since. Hypothes.is Intro from Hypothes.is on Vimeo. But the primary concern of the Kickstarter campaign is actually the problem of truth itself in the internet era. As Dan says in the video, “Hypothes.is grew out of a frustration with the difficulty of knowing what’s credible within a constant firehose of often conflicting information.” If folks were worried about the uncertain nature of truth online five years ago, it seems to have played an exceptionally terrifying role in the 2016 US presidential campaign. And as Dan argues rightly, bad information leads to bad decisions. We need means of verifying information outside of the information source itself. The “hypothesis” of Hypothes.is is that web annotation will power a crowd-sourced system of fact- and bias-checking that acts as a corrective for bad information and propaganda. Comments sections have served this purpose in the past to an extent, but we might think of web annotation as an evolution of (rather than proxy for) page-bottom commentary. Maybe it’s the English teacher in me, having taught students for many years to base their claims on textual evidence, but I think annotation is simply better structured for civic online discourse. Aside from the spatiality of page-bottom comments – afterthoughts, unattached to specific texts versus annotations directly connected to textual evidence – page bottom comments are moderated by page owners and thus not truly democratic spaces, even though such moderation is clearly necessary for civility and readability. Now, I also like to think of web annotation and Hypothes.is as bettering Twitter in some different ways. Twitter has clearly enabled important social movements to amplify their causes in incredibly valuable ways, disrupting mainstream media if we want to put it that way. But again, as with page bottom comments, this conversation happens at a remove from the text under discussion and to some extent this is where the vitriol is allowed to seep in. Would annotation temper Trump’s tantrums in a way Twitter does not? Maybe not. But certainly this election has been characterized by a lot of ungrounded claims that could be subjected to inline critique. And some news outlets have in fact been leveraging web annotation for this specific purpose. But even more important than the format of commentary is the politics of the commentary platforms themselves. Critical users of digital media and digital pedagogical tools are familiar with the idea that we need to think deliberately about the services we sign up for, but it’s worth bringing up here. Whether Google or Facebook, we don’t want a for-profit corporation determining what information we see because their ultimate responsibility is not to knowledge production, to them it’s little more than a tagline. And, by the way, I think Twitter gets off way too easy in these conversations. I get the idea that back channels can exist within such a hegemonic system, and that working with coded language within hierarchical cultural structures can be subversive. But we also want to institutionalize certain freedoms, right? If there are better systems for disseminating information and conducting conversation, let’s build them. RK: There’s much to unpack in your response to my prompt – from the limitations of Twitter, to the origins of Hypothes.is, to web annotation as civic discourse. I would be remiss, however, if I did not first mention that I graduated from Earlham College, a small, liberal arts Quaker school located in rural Indiana. Though I am not Quaker, I chose to attend Earlham because of the school’s principles and practices (perhaps we might annotate the online version of that text in partnership with students and faculty! ), a public declaration that guides the academic, social, and spiritual activities of those associated with this intentional community. Why mention Earlham and Quakerism? Because you began by describing Hypothes.is as a project designed to speak truth to power. Reading this, I wonder if web annotation creates conditions for more critical conversations with and about power, and in qualitatively different ways than platforms like Twitter. How so? It appears that the authors of Speak Truth to Power found limitation with argumentation (“it will not be the argument that convinces”). That sounds a lot like the shortcomings of Twitter and Facebook to me! If, on the other hand, introspection and a personal “sense of integrity” are tipping points that influence personal decision-making and social (inter)action, what are today’s online, socially networked, and civil opportunities to share such personal discernment with others in context? The public peer review afforded by web annotation may serve as an exercise of inquiry and expression whereby an individual (or a group) shares their truth with the powerful politician, or the think piece, or the publisher, declaring “Here I stand” by appearing in a text’s margins, writing truth with multimedia, and inviting response that is of consequence. Everyday social media platforms that encourage connecting and sharing have become increasingly polarized and dangerous to the detriment of civil discourse (for example, see Tressie McMillan Cottom’s critique of Twitter’s new @reply feature), whereas platforms that encourage public discernment may indicate a promising “evolution” (to borrow your term) of online commentary toward consequential political engagement. JD: Hmmm, so if argumentation is not the key, is it perhaps conversation? We’re mostly yelling at each other on Twitter, but perhaps open annotation will cultivate better conversation in the full sense: listening to authors, first of all, but also to other readers, and then sharing where we stand? I certainly like to think so. But before we get too carried away with ourselves about web annotation as the answer to the problems of the web, we need to discuss Tategate 2016. For those who are not familiar, I think my colleague Jon Udell’s blog summarizes the events and sets up the questions well. The controversy really caused our team at Hypothes.is to reflect on our project, both in terms of what we can do technologically to prevent abuse and the larger ethical and philosophical questions underlying the technology of web annotation. We used to have a phrase “without consent” in our company principles – it was meant to highlight the speaking truth to powerness I discuss above. But, especially in a case dealing with gendered power dynamics, we realized the problem with this language and the claim itself and changed our claim. RK: I also appreciate that you wrote about Tategate 2016 and concerns associated with online web annotation and abuse. Having observed the panel discussion about consent and abuse at I Annotate 2016 (and I commend Hypothes.is for organizing and extending that conversation), I remain conflicted and excited about some of the political dimensions afforded by a tool like Hypothes.is. The same technology that can spew hate speech on an individual’s blog post can also be used by community organizers to publicly critique proposed legislation. Like the Climate Feedback group (mentioned earlier in our “Open” exchange), should civil rights lawyers provide pro bono annotations atop the amicus briefs of upcoming legal proceedings? Should business school students and their professors annotate the corporate social responsibility statements or shareholder reports of multinational corporations? While there is educational value when teachers and their students annotate the political speeches of political candidates, what of the social value when a whistleblower posts confidential documentation online and then uses an anonymous Hypothes.is handle to comment upon negligence or overreach? There’s a thin line between the utility of speculative wondering and the futility of endless “what ifs.” With the hope of avoiding my own unmoored pessimism, I’ll foreground your interest in conducting and structuring enhanced civic (and civil) engagement as generative of promising practices and useful questions. For instance, I will suggest that despite web annotation not functioning as the answer to problems of the web – like intentional misinformation and prominent fake news – open and collaborative web annotation can likely serve as one site of social practice that calls out so-called post-truth claims as either abusive or unfounded. So here’s one related question back to you: Under what conditions does web annotation create the social and technical structures to enhance such civil, and trustworthy, online discourse? JD: Yikes! That’s a big question, especially since it’s about time we opened this up. And I really don’t know the answer. I do know Hypothes.is has to do more technically to prevent abuse – flags for inappropriate content, for example, along with a moderation system that deals with such abuse. Perhaps a way for a site owner to opt out of web annotation, though I worry such a feature would undo the ability to speak truth to power. We’ve also written Community Guidelines that we would love feedback on – I invite folks to annotate at that link. And I think we are starting with the right culture, a culture of civility and inquiry, but of course that’s no bulwark against trolls. You know, my role at Hypothes.is is to work with students and teachers using the tool. I’ve mentioned before about how inline annotation, in its orientation to text, might promote a more civil discussion. But I also think that if we begin by sharing this technology with youth in the learning process, then perhaps by the time web annotation is a part of everyday life on the Internet, people will be trained to engage more rigorously and respectfully with each other. Yes, I’m a hopeless humanist, but willing and ready to be called out. This dialogue, and the resulting article, would not have been possible without participation from the emergent collective of co-authors who voluntarily used the web annotation platform Hypothes.is to advance a public conversation. We are most appreciative of actualham, amarkham, amidont, BMBOD, ndsteinmetz, onewheeljoe, SenorG, silvertwin, and Whippo. We also thank the editors of this special and disrupted issue of the Journal of Media Practice – Jonathan Shaw, Janneke Adema, and Luca Morini – for their steadfast encouragement and critical feedback, as well as expert facilitation of an open and public peer review process. Broekman, Pauline van Mourik, Gary Hall, Ted Byfield, Shaun Hides, and Simon Worthington. 2014. Open Education: A Study in Disruption. London: Rowman & Littlefield International. Bush, Vannevar. 1945. “As We May Think.” The Atlantic, July. Goffman, Erving. 1981. Forms of Talk. Philadelphia: University of Pennsylvania Press. Jacobs, Jerry. 2013. In Defense of Disciplines: Interdisciplinarity and Specialization in the Research University. Chicago: The University of Chicago Press. Jenkins, Henry, Mizuko Ito, and danah boyd. 2015. Participatory Culture in a Networked Era: A Conversation on Youth, Learning, Commerce, and Politics. Cambridge: Polity Press. Jones, Jason. 2014. “There Are No New Directions in Annotations.” In Web Writing: Why and How for Liberal Arts Teaching and Learning, edited by Jack Dougherty and Tennyson O’Donnell, 263-274. Ann Arbor: University of Michigan Press. Liu, Alan. 2014. “The Big Bang of Online Reading.” In Advancing Digital Humanities: Research, Methods, Theories, edited by Paul Arthur and Katherine Bode, 274-290. New York: Palgrave Macmillan. Long, Christopher. 2014. Socratic and Platonic Political Philosophy: Practicing a Politics of Reading. Cambridge: Cambridge University Press. Rheingold, Howard. 2012. Net Smart: How to Thrive Online. Cambridge: MIT Press. Williams-Pierce, Caro, ed. 2016. Teacher Pioneers: Visions from the Edge of the Map. Pittsburgh: Carnegie Mellon: ETC Press.